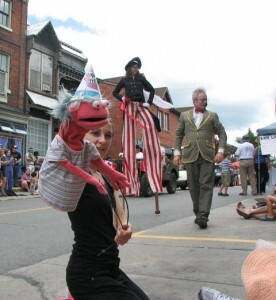 After hearing good things about the Puppets Up festival in Almonte last weekend, my husband and I decided to take the kid up on Sunday. 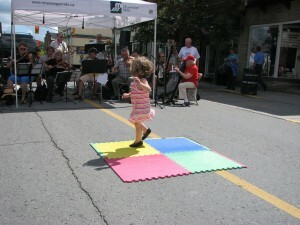 Almonte is one of our favourite day trips anyway, so the festival seemed like a bonus. It was expensive to get in, but there are shows all day and attractions up and down the street so you can make the most of it. Unfortunately we got there at an awkward time, missing the start times of shows that were age appropriate for our daughter, but reviews coming out of the shows were excellent (particularly for Cinderella and The Puppet Tamer). There were puppeteers roaming up and down the streets and interacting with passers-by, usually asking for hugs and high fives. And one show took place across two balconies. At one end of the street there were musicians playing, and my kid loves to dance so we sat there for a while and took advantage of some of the food being sold along the street. We did take advantage of the face painting (which was really great compared to some others we've seen), and we got a great spot for the parade. The kid was shy of the puppets at first, backing off a bit, but eventually she got into the fun of it. I think she'll enjoy it more next year when she's a bit older. We'll also plan better and look up the schedule before we head out. It was a good day, could have been a great day and fun for all ages.